Although she managed to gather a strong fan base with just one film, Taxiwala, Priyanka Jawalkar hasn’t let that affect her good-natured approach to everything. A couple of minutes into our very first conversation with her, and we were already talking about makeup, nails, shopping, and food! 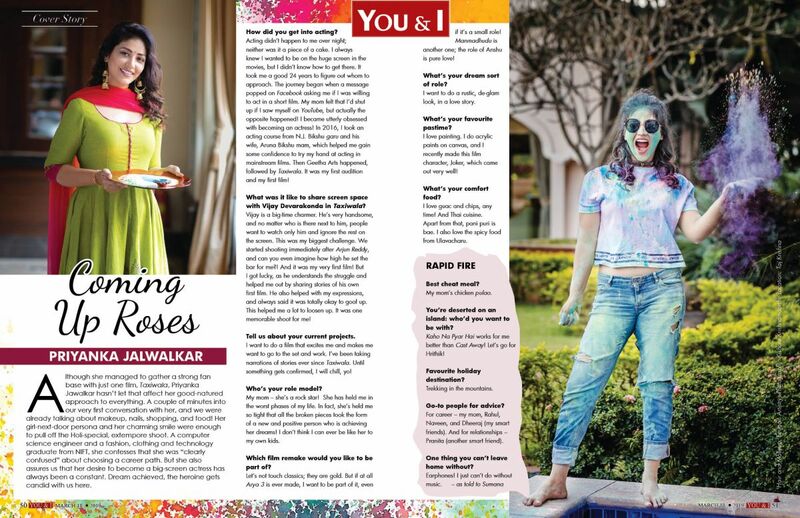 Her girl-next-door persona and her charming smile were enough to pull off the Holi-special, extempore shoot. A computer science engineer and a fashion, clothing and technology graduate from NIFT, she confesses that she was “clearly confused” about choosing a career path. But she also assures us that her desire to become a big-screen actress has always been a constant. Dream achieved, the heroine gets candid with us here. Acting didn’t happen to me over night; neither was it a piece of a cake. I always knew I wanted to be on the huge screen in the movies, but I didn’t know how to get there. It took me a good 24 years to figure out whom to approach. The journey began when a message popped on Facebook asking me if I was willing to act in a short film. My mom felt that I’d shut up if I saw myself on YouTube, but actually the opposite happened! I became utterly obsessed with becoming an actress! In 2016, I took an acting course from N.J. Bikshu garu and his wife, Aruna Bikshu mam, which helped me gain some confidence to try my hand at acting in mainstream films. Then Geetha Arts happened, followed by Taxiwala. It was my first audition and my first film! What was it like to share screen space with Vijay Devarakonda in Taxiwala? Vijay is a big-time charmer. He’s very handsome, and no matter who is there next to him, people want to watch only him and ignore the rest on the screen. This was my biggest challenge. We started shooting immediately after Arjun Reddy, and can you even imagine how high he set the bar for me?! And it was my very first film! But I got lucky, as he understands the struggle and helped me out by sharing stories of his own first film. He also helped with my expressions, and always said it was totally okay to goof up. This helped me a lot to loosen up. It was one memorable shoot for me! I want to do a film that excites me and makes me want to go to the set and work. I’ve been taking narrations of stories ever since Taxiwala. Until something gets confirmed, I will chill, yo! My mom – she’s a rock star! She has held me in the worst phases of my life. In fact, she’s held me so tight that all the broken pieces took the form of a new and positive person who is achieving her dreams! I don’t think I can ever be like her to my own kids. Which film remake would you like to be part of? Let’s not touch classics; they are gold. But if at all Arya 3 is ever made, I want to be part of it, even if it’s a small role! Manmadhudu is another one; the role of Anshu is pure love! What’s your dream sort of role? I want to do a rustic, de-glam look, in a love story. I love painting. I do acrylic paints on canvas, and I recently made this film character, Joker, which came out very well! I love guac and chips, any time! And Thai cuisine. Apart from that, pani puri is bae. I also love the spicy food from Ulavacharu. You’re deserted on an island: who’d you want to be with? Kaho Na Pyar Hai works for me better than Cast Away! Let’s go for Hrithik! For career – my mom, Rahul, Naveen, and Dheeraj (my smart friends). And for relationships – Pranita (another smart friend).